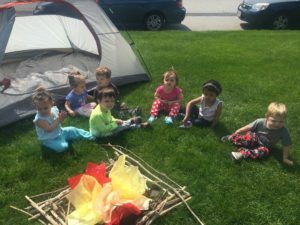 Mini-Miracles enjoyed camping day on May 20th. Along with it being camping day, it was also pajama day! 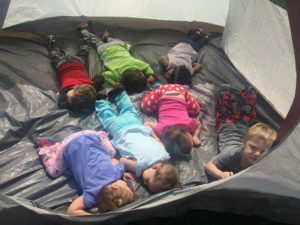 Students participated in activities such as, sharing stories around the camp fire, exploring the inside of tents, pretend fishing, studying different insects in the dirt and playing games of horseshoe. 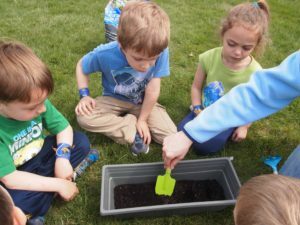 Following those activities, each class was able to eat their lunch picnic-style outside. The day ended with arts and crafts and yummy s’mores! April 2nd was Autism Awareness Day. Mini-Miracles dedicated the day and month to spreading Autism awareness, understanding and education! 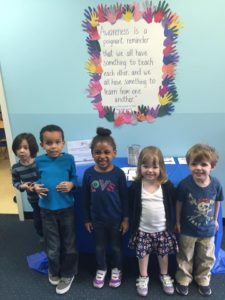 To show support everyone wore blue and decorated the center! A raffle table was set up for families to be entered in winning a trip to the Discovery Museum! All proceeds raised went to our neighbors at RCS Learning Center, a non-profit school for children with Autism. 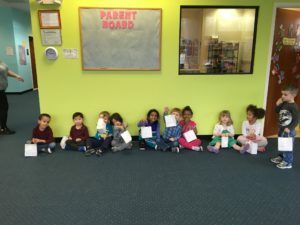 Mini- Miracles had their MASSIVE Egg hunt on March 28th this year! 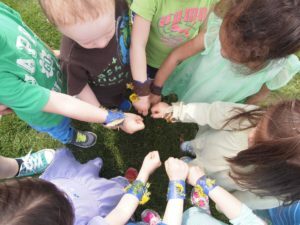 The entire school participated in searching for eggs with hidden treats inside. We would like to give a special thanks to all the families who helped make this day a success by sending in goodies! February 2016 was music month! Throughout the month Mini-Miracles classes appreciated music in different ways. 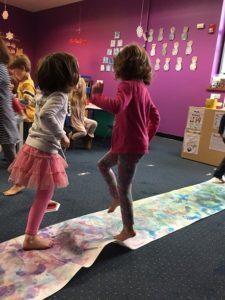 A few favorite activities of music month were playing with musical instruments, music themed crafts and freeze dance feet painting. 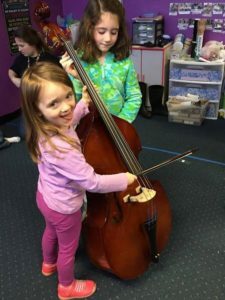 On February 19th a generous family brought in their personal instruments to share with the students and even preformed a few songs! Being able to see, play and listen to different instruments enhanced students learning and excitement! 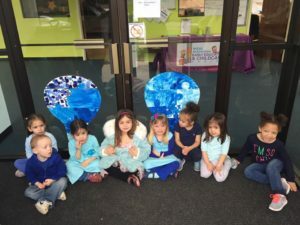 On January 29th we celebrated our first ever Frozen day here at Mini-Miracles Early Education and Child Care Center! 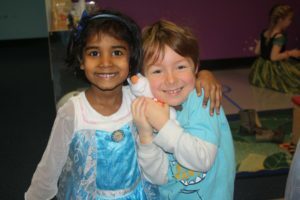 The day was filled with excitement as children came to school dressed as their favorite Disney’s Frozen movie character. 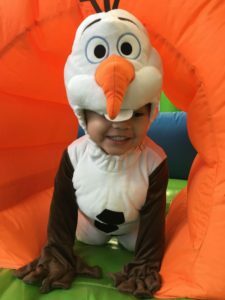 Each classroom visited Elsa’s castle, sang along and danced to the movie soundtrack, ran through a bubble snow storm, played on the jungle gym bouncy and read a story with a special surprise guest… Olaf! 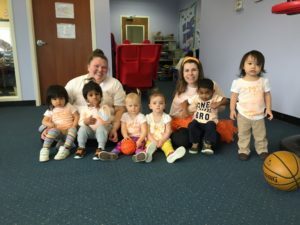 On October 30th, Mini- Miracles Early Education and Child Care Center celebrated Halloween during our Annual Halloween parade! 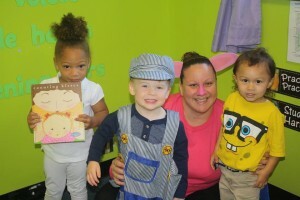 All of our students were encouraged to dress up in costumes, along with staff! Our kiddos enjoyed sweet treats, games, and Trick-or- Treated thought the business park to neighboring companies. Thank you again to IVG Metro-west, Charles River Arc, Coffee Pond Photography, and Exponent for participating in our Halloween parade and letting our little ones Trick-or-Treat at your doors! Our students had a bast! October 15, 2015 was another exciting day at Mini-Miracles. Our Pre-K classes took a field trip to Belkin Farm to go apple picking! While the “big kids” were on their trip, our Infants and Toddlers had a surprise apple picking trip of their own-right here at the center! Mrs. Cait turned Mini-Miracles into a farm with hay bails, pumpkins, and hanging apples to pick! 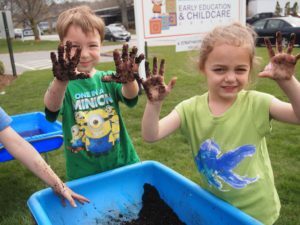 The day was full of laughter and smiles, while our little ones enjoyed face painting, pictures by a hay bail, pumpkin painting, apple picking, and some homemade apple sauce! Our “big kids” also enjoyed their day on the farm while visiting the farm animals, carnival rides, apple picking, and more! What a great day! 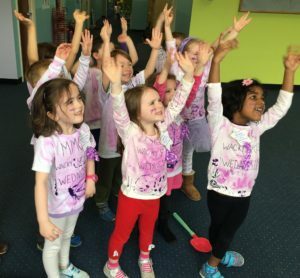 On September 21st through the 25th, Mini-Miracles hosted a very exciting Spirit Week The days consisted of Sports Day, School Color Day,Wacky Wednesday, Dress as your favorite Character From a Book Day, and Pajama Day. Each day was filled with surprise activities such as book readings, puppet shows, moon-bounces, and ice-cream trucks! Everyone had a blast including our staff, thank you to all who participated in making this such a great week for our little ones!